InnoGames offers players the chance to explore an exotic fantasy world with their new city-builder game: Elvenar – The latest, strategy-MMO title was announced today with details about the game. The German developer is treading on uncommon ground with Elvenar as players have to create a flourishing city and choose between Elves or Humans as a starting race. The games’ focus lies on building and upgrading a city, but players also trade, explore the world map or have strategic turn-based fights on a 3D battlefield. 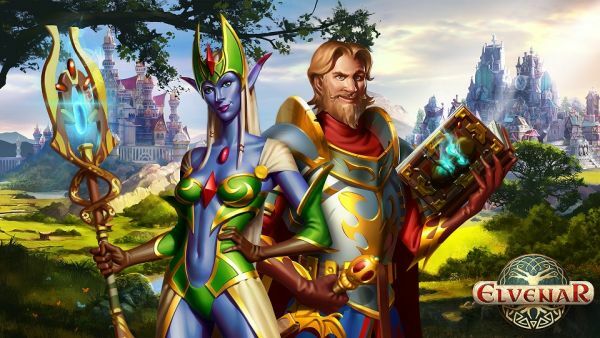 Elvenar will start in the browser; mobile versions are planned. The game’s closed beta is expected to start in January 2015. The choice between Elves and Humans influences the way the players’ cities and inhabitants look and which technologies and units are at their disposal. The Elves live and breathe magic and exist in close harmony with nature, whereas Humans are ambitious and determined engineers. “You will see some of the elvish buildings really come alive with lots of fantastical beings, like ents and golems co-existing peacefully in their cities”, explains Ulrike Kunkel, Producer of Elvenar. “The Humans on the other hand are a more technologically determined society, they focus on engineering to prevail. Our goal was to create differences in visuals and play style that make players want to try out both races at some point”, Kunkel adds. Between managing resources, levelling up buildings and unlocking new perks, players should also pay attention to the multiplayer map. There they can interact with neighbors, scout new provinces and unlock various powerful relics by fighting NPCs. Fights take place on various battlegrounds. The strategic battles are 3D-animated, with up to 20 different monsters and unit types, which make each encounter unique and tactically deep. Waren Story returns to the MMO front with Gplayon's first closed beta.